A face and neck lift may remove years from your face by improving the visible signs of aging caused by gravity, the environment, and stress. Dr. Patterson’s keen attention to detail provides very natural results for facelift patients. During a facelift, Dr. Patterson tightens your facial skin and underlying tissue to smooth out wrinkles and correct deep creases. An adjoining neck lift enhances the definition of your jawline and improves the contour of your chin. The first step in planning your face and neck lift surgery is a consultation with Dr. Patterson. The timing of the surgery can be important since there is some recovery time involved. Discuss your lifestyle and obligations with Dr. Patterson to determine the best way to achieve a peaceful surgery and an optimum recovery. Preparation for a face and neck lift procedure may take as long as a couple of weeks, depending on a patient’s current lifestyle. Dr. Patterson will need to see a complete list of current medications, including herbal supplements, before the surgery. Some of these medications, for example, aspirin may need to be discontinued for a few days to a week prior to the surgery. Patients who smoke are strongly encouraged to stop smoking prior to a face and neck lift procedure. The facelift procedure typically takes several hours with the neck lift procedure taking 1-2 hours. You will either go home the same day or stay overnight in the hospital depending on your individual needs. The face and neck lift procedure is done by redraping skin in the neck while removing excess skin and tightening muscles in order to improve loose skin. Sutures are normally removed within 4-10 days (unless dissolvable). Most patients return to non-strenuous work 7-10 days following surgery. Swelling, bruising, and soreness are typically gone within 2-3 weeks. Strenuous activities can be resumed at approximately 6-8 weeks postop. After a face and neck lift, vigorous exercise should be completely avoided for 4 weeks. Moderate exercise should be avoided for a minimum of 7 days postop. After the dressings are removed, clean suture lines with hydrogen peroxide and a cotton swab once a day until the sutures are removed. Keeping the suture lines clean will make suture removal easier and less uncomfortable. Apply a small amount of antibiotic ointment to the suture lines following cleaning. Use artificial tears (Refresh, GenTeal, etc.) in your eyes at least four times a day if they feel dry or irritated. Use petrolatum (Lacri-Lube, Refresh PM) In your eyes at bedtime for the first few nights if they feel dry or irritated. Do not wear contact lenses as long as they feel dry or irritated. Continue intermittent cold compresses over the face and neck for at least one week. Expect significant bruising and swelling in the face and neck for at least 14 days. Swelling, lumpiness, tightness, and numbness will gradually diminish over the next several months. Elevation of your head even while sleeping will help to minimize postoperative swelling and discomfort. Avoidance of vigorous activity will help to minimize postoperative swelling and discomfort. You can reduce the risk of postoperative bleeding by avoiding blood thinners such as aspirin, ibuprofen, naproxen, prescription anticoagulants, or other NSAIDs for about 10 days prior to and several days after the procedure. Do not apply make up to the face for the first week. Do not shave your face for the first week. It is acceptable to shower and wash your hair once the dressings are removed. Use a gentle soap such as Cetaphil. Do not resume use of tretinoin (Retin-A, Renova, etc.) for to weeks postop. Use at least SPF 15 sunscreen over the healed incisions if sun exposure is expected for at least two months postop. Redevelopment of skin laxity is an unavoidable result of aging and loss of tissue elasticity. Although every effort is made to optimize the outcome of your surgery, please understand that some skin laxity is inevitable. Still have some questions, or want to find out more? The next step is easy, schedule a consult with Dr. Patterson. 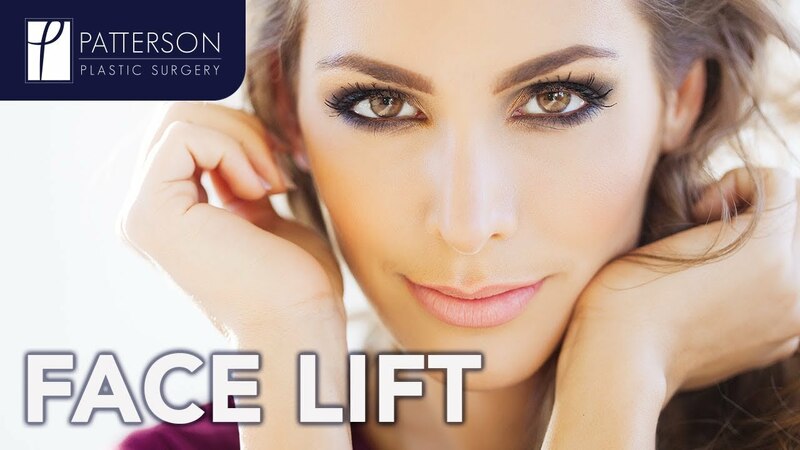 Our staff will be happy to discuss a face and neck lift with you further. At Patterson Plastic Surgery, we want to be your partner in achieving the appearance you’ve always wanted! At Patterson Plastic Surgery, the face and neck lift surgery is performed by Dr. Patterson, a Board Certified Plastic Surgeon. As a member of The American Society of Plastic Surgeons (ASPS), the Florida Society of Plastic Surgeons, the American Medical Association, and a Fellow of the American College of Surgeons (FACS,) Dr. Patterson is uniquely suited to perform this surgery. This superior level of expertise, coupled with an innate ability to understand and relate to patients, makes Patterson Plastic Surgery the premier center for cosmetic, plastic, and reconstructive surgery in the Gulf Coast area. A facelift is a surgical procedure that can revitalize the lower part of the face as well as the upper part of the neck. The goal with facelift is to create a more youthful look. Here are some of the most commonly asked questions about facelifts today. Good face lift candidates are in excellent overall health, with no cardiac issues and no bleeding disorders. If you’re troubled by sagging or loose skin in the lower skin and upper neck, you might be a good candidate for this surgery. One of the most important considerations when it comes to face lift is expectations. Patients who are looking for or expecting a dramatic overall change in their entire face and neck area may not be ideal candidates for a face lift. However, you can be a good candidate as long as you understand that other procedures may be necessary if you want to achieve a whole face and neck rejuvenation. The scars from a face lift are in the hairline, around the ears, behind the ears, and in some cases under the chin. Because Dr. Patterson meticulously makes the incisions in the most unobtrusive way possible, they’re very well concealed. Once the scars heal, they’ll usually be nearly invisible. Are there any areas of the face that a face lift might not help? Botox can smooth away lines in the forehead and eye area, and it can help preserve the results of surgical procedures. Dr. Patterson typically removes your sutures 7 days after your face lift, unless dissolvable sutures were used. Most patients are able to return to work at that point. Most light activity is fine about a week after face lift, but strenuous physical activity must wait for 6-8 weeks. Should I have a neck lift done at the same time? Many patients do opt for a neck lift at the same time, as a combination of these two procedures can ensure an attractive and uniform looking result. By doing a neck lift at the same time as the face lift, Dr. Patterson can emphasize your jaw definition and create an improved contour for your chin. Not sure whether you’d benefit from doing both procedures? At your consultation with Dr. Patterson, you can get a thorough evaluation and find out whether these procedures would work for you. Considering face lift, but need to know more? Dr. Nathan Patterson and the whole Patterson Plastic Surgery team are glad to help. Contact us anytime to arrange a face lift consultation where we can discuss your needs and appearance goals. We love to help patients create more beautiful versions of themselves!